Happy Halloween, Blue Ridge Nation! We’ve been sharing lots of tasty holiday recipes with you, and the day is finally here! 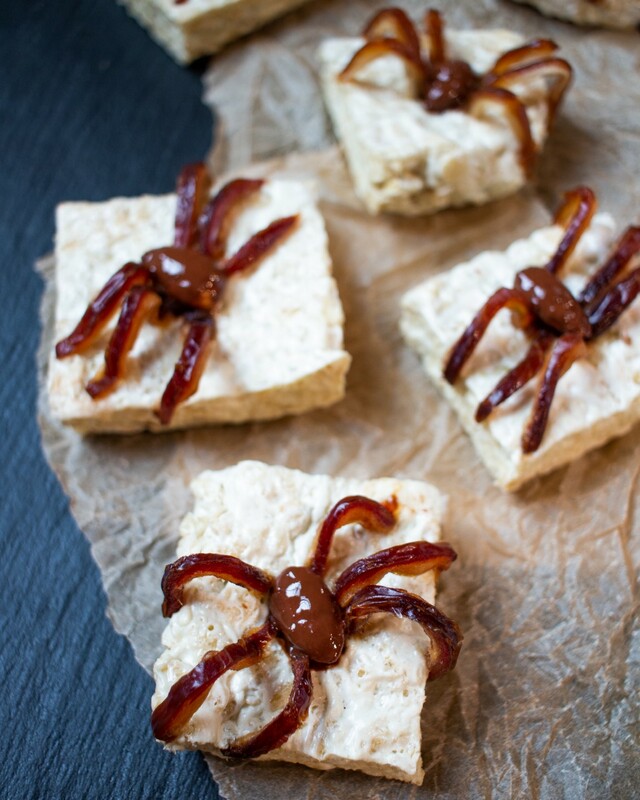 These creepy-crawly rice krispie treats are our favorite Halloween recipe yet. They’re perfectly sticky and sweet, and friendly for vegans because they’re made with @mydandiesvegan marshmallows. They’re great for Halloween gathering, or make up an extra big batch and give these out to trick-or-treaters. They’ll love having something extra special to enjoy right away! In a pot on medium heat, melt marshmallows until they begin to break down, constantly mixing so they do not burn. When the marshmallows begin to break down add in you coconut oil and combine. Stir in rice krispies and remove mixture from the heat. Place in a pan lined with saran wrap or parchment paper and spread evenly throughout the pan. Place in the fridge or freezer to cool. Remove pits from the dates and flatten out each half of your date. Slice into thin strips and set aside. Once your rice crispy treats have cooled, remove them from your pan and slice into squares. Place one chocolate covered almond on the center of each square, and assemble three date strips on either side of the almond. The dates’ sticky texture will help you adhere them to the rice crispy treat.